The CGIAR Research Program on Dryland Systems has been out and about the last four years advocating for sustainable land management (SLM) through the Economics of Land Degradation (ELD) Initiative. To consolidate ELD’s aim of making SLM practices an integral part of policy strategies and decision making, its most recent publication, Sustainable Land Management: A Business Opportunity, recognizes the private sector as a key actor in the change process. The report highlights the opportunities and benefits for the private sector in directly and indirectly investing in SLM. The finding and recommendations of the report are being shared with a varied audience of science experts and policy makers participating in the 2016 IUCN World Conservation Congress. The conference, which is the biggest recurring event of its kind, is running from 1-10 September in Hawai’i, and has brought together world leaders from the science, business and government sectors for ten days of momentous discussions on the most pressing environmental issues of today. The conference is hosting a series of sessions that cover a vast variety of topics such as ocean governance and policy, best practices in conservation genetics, and youth engagement in climate change action. This report from the Economics of Land Degradation Initiative makes the business case for sustainable land management. It explores in great detail the economic incentives — or lack thereof — for action, and investigates how multi-stakeholder partnerships between the private sector, civil society, and government can help catalyse action. It presents the opportunities of investing in sustainable land management for different categories of businesses in different geographies,” said Naoko Ishii, CEO & Chairperson of the Global Environment Facility (GEF). 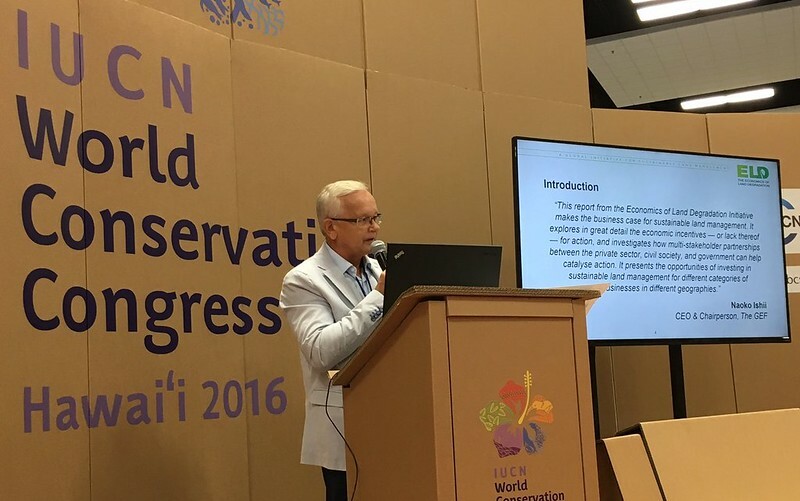 Dr. Richard Thomas presenting the ELD Initiative's private sector report at the IUCN 2016 World Conservation Congress. Photo Credit: ELD Initiative. The report provides an innovative toolbox for the private sector to develop a business strategy incorporating SLM practices. The selling point for applicability is that it takes into consideration the relative size of the business as well as scope and cost of operations. For example, investment or financing recommendations for farmers and individual smallholders differ from those proposed for small, medium or large businesses, or for multinational corporations. The session concluded with a consensus on the value and benefit of investing in SLM practices for any business dependant on land in their supply chain. It was apparent that the private sector had a vital and influential role to play in addressing the growing global issue of land degradation. The cross-cutting theme that surfaced in almost every discussion at the conference was the solid need for smart partnerships and increased connectivity among all actors, in order to achieve our joint vision for a conserved, sustainable planet. Marah Al Malalha is the Science Communications and Knowledge Management Intern at the CGIAR Research Program on Dryland Systems. Cornell, A., Weier, J., Stewart, N., Spurgeon, J., Etter, H., Thomas, R., Favretto, N, Chilombo, A., van Duivenbooden, N., van Beek, C., and de Ponti, T. (2016). Economics of Land Degradation Initiative: Report for the private sector. Sustainable land management – A business opportunity. GIZ: Bonn, Germany.